There was a song sparrow hopping along the boardwalk that leads to the lake. It was a little too far and a little too mobile for my camera to focus on it well. By chance, this picture also has Mallards (4 males and one female), American Wigeons (3 males one female), a Common Merganser (female) and a Ring-necked Duck (male). 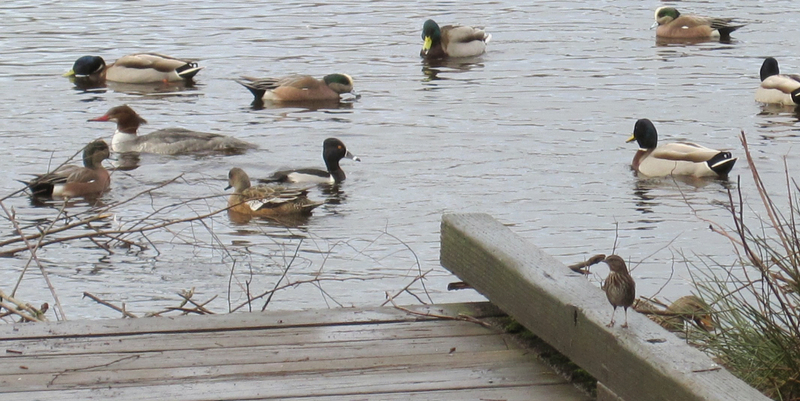 As I walked around the lake, I only ever noticed one Common Merganser and one Ring-necked Duck. Maybe they were flying solo?